This rough sketch is in pencil on a tinted wash background. The 'Town Malling' referred to in the title is the small Kent town of West Malling. 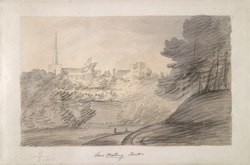 The church in view is most likely St Mary's, the parish church. This building was Norman in origin, but was extended in the 13th century and the nave was rebuilt in 1780/82.